Telepathy is the first unit derived from 「F.A.R.M」, the idol project by For Life Music Entertainment. They call themselves the world’s first air guitar idols. The five members are Nanamin, Mojya, Macky, Nako and Mapo,all of them being teenagers between 13yearls old to 17years old. They are the newest idol unit at the moment. Their most distinctive characteristic is the “air guitar performance”. The “air guitar” they present is a new style of performance,slightly different from other air bands which pursues realism. A new type of “air guitar performance” will be spread to the world from this unit. 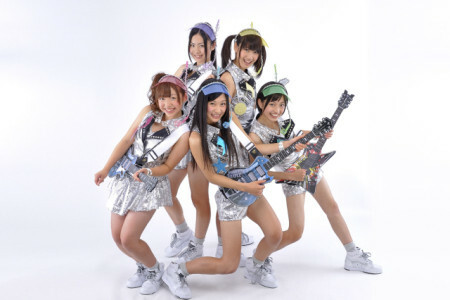 In order to establish a vision beyond just being cutting edge in the idol scene that is going through a “warring state era”, they have incorporated elements of “SF” and “fantasy”, as suggested by the band’s name Telepathy. Their vision is based on “behind the story setting” that are hidden in the contents of Japanese anime and manga. With a focus on storyline and skills, they aim for an entertainment that has more than just “Nice to meet you, I’m happy.” feeling. By saying farewell to “combativeness”,Telepathy are trying to spearhead the end of the “idol warring era” by bringing the“peaceful and tranquil era”. This makes them special and different from other idols that debuted in 2012.